RC-U will delight you. Installation in a few minutes (depending on model). Our supplemental control unit provides many vehicles with turbo diesel or turbo petrol engines a power increase of up to 31%. At the same time, you can save up to 1 litre of fuel per 100 kilometres. Our database covers over 2,200 vehicles to fit RaceChip® power boxes. We read data from the engine control unit in real time, and optimise many characteristics. These data include items such as injection timing, injection quantity, injection pressure, boost pressure and air mass. As opposed to tuning using the OBD interface, the control unit itself is not overwritten. Thus the RaceChip® leaves no evidence after being removed, and the manufacturer’s software remains in place even after software updates. It's up to 31% more power, up tp 26% more torque, saves up to 1L/100km of fuel. What are you waiting for? us @ 90303389 now! Hi there, can do for FL W204 1.6 CGI? Sorry for the late reply. Yes, it can be done for the W204 1.6 turbo CGi. Can pm me the price and wat the difference compared to the piggy back from Dr Hannson? Backside feeling itchy, thinking to swap to other brands. PMed you the price. We are sorry we cannot comment on what Dr Hannson is selling as we have not tested or seen his product. Pls pm me the price for w212 2010. Sorry for the late reply. PM sent. What is the price for w246?? pls PM the price and gains for w176 a200. For A200, power increase is 156 to 199HP and 250 to 320nM of torque! PMed you the price and Happy Boxing Day! We are very sure you can feel the difference! PMed you the price. Pls PM me the price to racechip cla180. Comes with 24 mth warranty as advertised in link below? Does car need to be run-in first? Can you page me for W246 B180 pls? Include installation? How long is the warranty? Thanks. W212 E250 2010 price ? PM me for the price on CLA 200 and what's the power increase after installation? What is the price for W204 FL 1.8 turbo ? Hi, can you PM the price for CLA 200 ... Thank you. 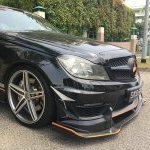 How much for w204 c200 fl? Can you advise me whether this can be done on a GLA180 (2017 model)? Being driving for a while now and notice pick up speed is so much slower the VANs along the road.